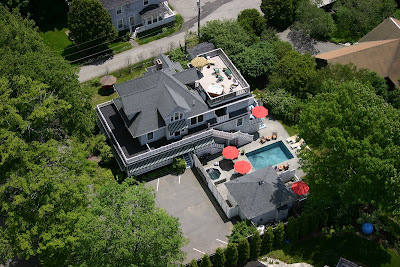 Maine Inn Broker of Inns, Bed and Breakfasts, motels, educating inn buyers and sellers: A NEW LISTING on Mount Desert Island! This is The Lindenwood Inn. Built as a sea captain's home in 1904, this is a fabulous 9 room Inn located on a quiet residential side street, Clark Point Road, just a 15 minute walk to shops and restaurants in town. Just beyond the inn is the coast guard station and popular lobster pier. 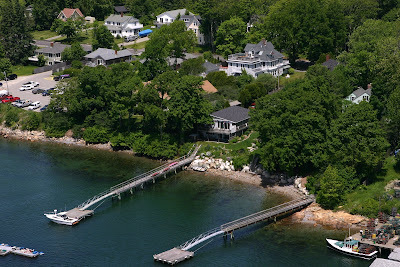 The inn has some of the best harbor views around; many rooms have a private deck to enjoy the view. The penthouse suite has a spectacular private deck with its own hot tub as well as a view that cannot be beat. Beautiful slate surrounds the outdoor pool and hot tub area where guests can lounge in the sun. Guest rooms are spacious with private baths, beautiful furniture and bedding. Collectibles from the owner’s travels are scattered throughout, many of which will remain with the inn since they’ve contributed to the inn’s popular style. The lower level of the inn offers common guest lounges and game room. Alternatively, it’s a spacious owner’s apartment with master bedroom suite with large Jacuzzi, small office, large living and dining area, full kitchen, storage space, small spare bedroom/den, laundry. Interior perimeter walls are beautiful granite block, floors are terra cotta, very European. The style of this inn is contemporary meets traditional where global influence is evident; everything about The Lindenwood Inn is unique. The property enjoys substantial gross room revenue during its 6 month operation but could easily do much higher numbers from an extended season. The inn used to offer full restaurant services and could once again. Poolside service would be a fantastic addition to the inn's amenities, or even casual room service or bistro style dining. The beauty of this property is the ability to personalize it to your own taste. There's enough space and options for expanding to suit many needs, including catering, events and weddings. 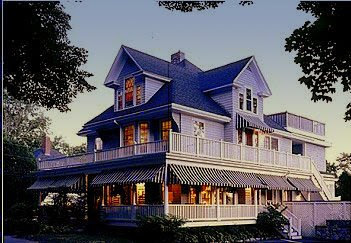 The location of this inn benefits from the volume of visitors Acadia National Park brings to the island. The options are limited only to your imagination. Absolutley Gorgeous and what a perfect spot.